Map of Proposed Railway. © Arctic Corridor. On Monday, I spoke with Timo Lohi, who is heading up the Arctic Corridor project based in Finland. The Arctic Corridor is described as a “new cross-border economic area as well as a transport and development corridor.” Financed by municipalities in Northern Lapland, the City of Rovaniemi, and the Regional Council of Lapland, the project began approximately five years ago as a means of capitalizing on the potential of Arctic resources and the Northern Sea Route (NSR), which shortens the distance between Asia and Europe by up to 40%. Lohi, who works on marketing and networking for the Arctic Corridor, explained, “We would like to connect these opportunities here in Finland, Norway, and Europe to this new transport route. The shorter distance is business opportunity for our company.” To connect Finnish businesses into the NSR, a crucial part of the project is a proposed railway connection between Rovaniemi, Finland and Kirkenes, Norway. Earlier this month, the project released a video visualizing their aspirations for the transportation route. Arctic Corridor is marketing their efforts to a wide spectrum of interests but has honed in specifically on mining, especially since the industry is developing in northern Finland. Arctic Corridor brochure in Korean. The Arctic Corridor is billed as a project to connect European markets more closely to the Arctic. “The EU’s quickest connection to the Arctic,” the website announces. A rail connection from Kirkenes to Rovaniemi would link into the entire Finnish rail network and facilitate connections to the Baltic Sea region and beyond. 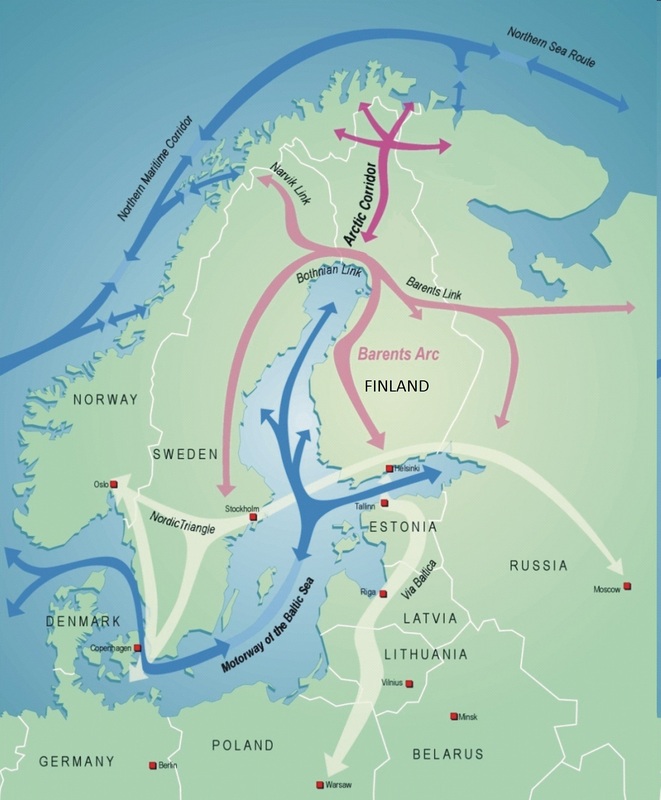 It seems, however, that the Arctic Corridor is also a key way of linking Finland into the maritime Arctic via coastal Norway. Finland has a less prominent profile in the Arctic than Norway, which has managed to attract a lot of interest from East Asian countries interested in the Arctic as a shipping thoroughfare. Finland has substantial experience in ice navigation, yet its coastline is generally oriented south towards the Baltic Sea rather than north towards the Arctic Ocean. In a way, this has hampered the country’s geoeconomic position in the Arctic, as many of the region’s latest developments have centered on the Northern Sea Route and moving hydrocarbons and cargo via the ocean rather than over land. If Finland had a rail connection to the sea, this would open up more export possibilities for its northern resources, which is perhaps why the municipalities and local governments in northern Finland are financing the Arctic Corridor project. Asia, of course, is at the eastern end of the NSR. The brochure for the Arctic Railway is available in English, Korean, and Chinese, underscoring the East Asian interest in the transportation and natural resource possibilities offered by the Arctic – particularly in Fennoscandia. Arctic Corridor is still very much a project in the preliminary stages, but it reflects the larger dynamic of countries trying to capitalize on the potential of Arctic shipping even when they do not have a coastline themselves. It also opens up the possibility of the Arctic economy expanding to include “near-Arctic” places like China, South Korea, and Japan, and also the Baltic states of Estonia, Latvia, and Lithuania, which have been called the “Nordic near-abroad” (Lehti, 2003, p. 21) following the formation of the Baltic Sea Area in the 1990s. Lithuania’s energy minister spoke earlier this week to the U.S. Senate Committee on Energy and Natural Resources, urging the U.S. to begin exporting its wealth of liquefied natural gas (LNG). Combined with the new LNG terminal at Klaipeda in Lithuania set to open later this year, projects like the Arctic Corridor crucially promise to help diversify the sources of natural resources for countries on the Baltic Sea away from Russia and towards the north and west instead. This could serve as another way in which economic developments in one part of the Arctic could weaken Russia even as it seeks to develop its own Arctic backyard to strengthen its economy. What are the project’s upcoming plans? One of our main goals in the future is to have closer cooperation with Norway and get them more involved with this corridor. We’ve just started a process called Arctic Benchmarking, and this year, we’ll visit four or five cities in northern Norway: Hammerfest, Tromsø, Kirkenes, and two other trips in summer – again to Kirkenes, and then maybe to Alta or Narvik to cooperate with companies and businesses. Which countries in Asia are most interested in Arctic Corridor? We visited South Korea in May and China in June. Those two countries are the most important. I notice that both are interested in the Arctic itself with the Arctic Council. China – I think they have produced some new icebreakers and are very interested, but perhaps South Korea will have more transportation in the future. Very interesting countries. Are you working with partners in Russia at the moment? With Russia, there’s not much cooperation. It’s more in tourism and trade, and of course we get some goods and information – Atomflot for instance, and in Kirkenes there is a Northern Sea Route Information Office. But at the moment there’s not too much cooperation with Russia because we are more oriented towards Norway. [However,] we are interested in the Trans-Siberian Railway if there’s some potential for us to have connections, and also the North East West Corridor . How have indigenous peoples in the region, namely the Sami, reacted so far to the project? Of course there will be some discussions, but at the moment there are not many because it’s such a long-term process. We have this regional planning work for the railway starting in 2016, which will take about three to four years. This is when we will discuss with the local population about the obstacles there will be, so at the moment there are not too many discussions with them. But we’ve had some discussions with reindeer industry and organizations, and they’re hoping that if there’s going to be a lot of transport between Kirkenes and Finland, it’s better for the reindeer industry that it be a railway connection than trucks. These discussions will begin in 2016, and we’ll start planning for that in Northern Lapland. There will be full cooperation. Are the effect of climate change, such as permafrost melt, at all a concern for the Arctic Corridor? We haven’t at the moment thought or discussed this because those questions don’t concern Finland or Norway. Permafrost melt is more of a Siberian issue, so it’s not an issue [for us]. Of course, there’s more discussion about climate change, and there are some positive and some negative influences. Perhaps from an economic point of view, this transport route may be a positive at least within the next 50 to 100 years. The North East West Corridor is a proposed land and sea transportation route linking Central Asia and the North American East Coast via an intermodal port facility in Narvik. The Kolarctic ENPI CBC 2007-2013 Programme offers a bit more information here.